We have a signed agreement with the FC for maintaining the trails in Thrunton Woods, and develop them with the objective of keeping them as natural as possible.We are totally self funded as a group, with some help from the Forestry Commission for materials and tools. 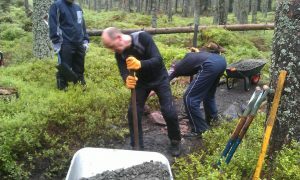 The types of trails tend to be towards the technical cross country style.The group is very low key, we keep bureaucracy to a minimum and maintain trails that we enjoy to ride. If you have any queries please contact the secretary Sean on the following email address sean@thruntontrailbuilders.co.uk. YOUR MEMBERSHIP IS REALLY IMPORTANT. 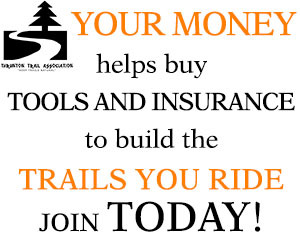 Without it we wouldn’t be able to pay for our tools or the insurance to cover us whilst we maintain the trails you ride.